In March ACT will be bringing to the stage the outrageous and rarely performed comedy Can’t Pay?, Won’t Pay! written by Dario Fo, translated by Lino Pertile and adapted by Bill Colvill and Robert Walker. 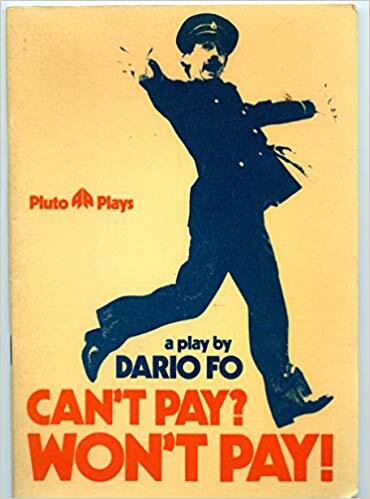 Written in the crisis-hit atmosphere of 1970s Italy, this hilarious and critically acclaimed farce centres on direct action by housewives against inflationary supermarket prices and struggles with their Communist trade unionist husbands who face unemployment and worse!Can’t Pay?, Won’t Pay! is performed at 7.45pm from Wednesday 13th to Saturday 16th March at Alsager Civic. Tickets are £10 (£8 for under 21s): from the Box Office on 01260 276165 or from Alsager Library or Alsager Civic.